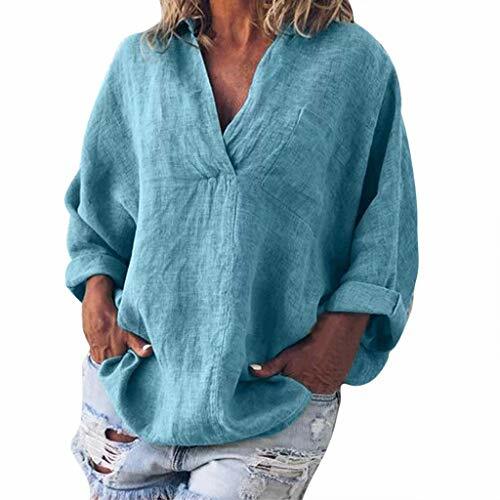 This casual blouse is made of lightweight breathable linen and cotton material, round neck with 5 buttons closure, cuff with button, back pleated, hi-low hem design. 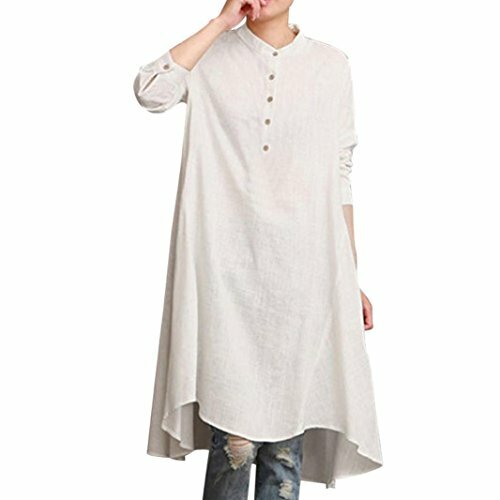 Loose fit tunics blouse can wear in spring, summer, autumn for any occasion:travel, holiday, trip, work, streetwear, party, home... Size Information Size M: Length:25.6-27.2",Bust:42.5",Shoulder w/ Sleeve:22.4",Sleeve:7.1",Sleeve cir:17.3",Cuff:15.0" Size L: Length:26.0-27.6",Bust:45.7",Shoulder w/ Sleeve:22.8",Sleeve:7.5",Sleeve cir:18.9",Cuff:16.5" Size XL: Length:26.4-28.0",Bust:48.8",Shoulder w/ Sleeve:23.2",Sleeve:7.9",Sleeve cir:20.5",Cuff:18.1" Size 2XL: Length:26.8-28.3",Bust:52.0",Shoulder w/ Sleeve:23.6",Sleeve:8.3",Sleeve cir:22",Cuff:19.7" Warmly Note: Color difference: We strive to make our colors as accurate as possible; however, due to individual monitor settings, we cannot guarantee that the color you see on your screen is the exact color of the product. Size difference: This size information is just for reference only,and allow 1-2cm (0.4-0.8") differences due to manual measurement. It is very comfortable to touch and wear. 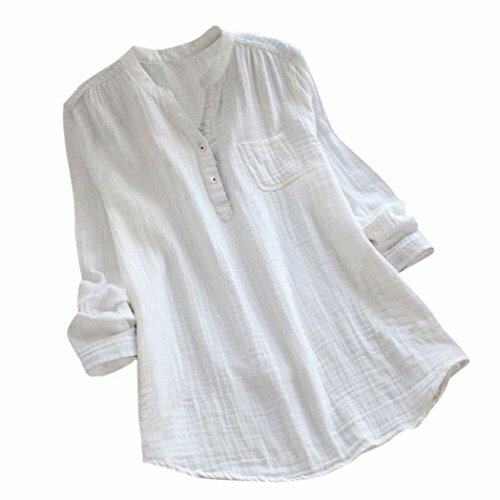 100 cotton linen blouses makes you more attractive, charming, fashion and elegant. We use post service (USPS, etc), express service (Fedex, DHL, UPS etc) to ship your package. You can easily get estimated delivery date when you place the order. We will never stop to pursuit your perfection. If you happen to have any other questions or concerns, please do not hesitate to contact us via e-mail. A classic top, elegance and grace! 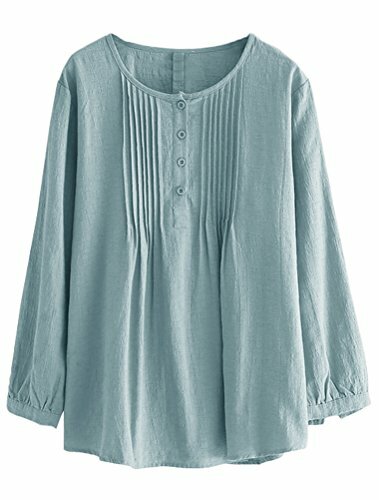 Breathe fully and move freely in this gauze cotton button down top. 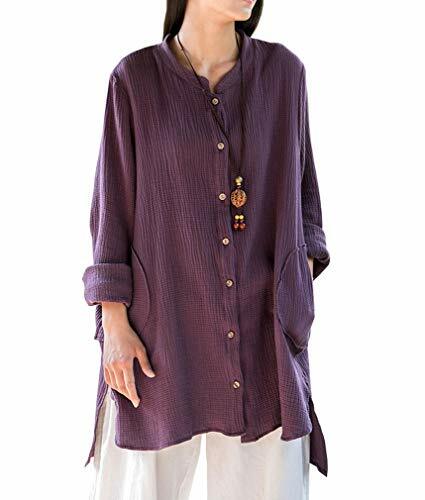 This top is special because it has a shapely feminine flow around the hips and the line of dark wood buttons down the center line is flattering and slimming. Size Chart, The Cardigan is tile measuring, there may be 0.8-1.2 inches Best Fit US 2-12, Bust: 115cm/45.2, Length: 58cm/22.8" We use post service (USPS, etc), express service (Fedex, DHL, UPS etc) to ship your package. You can easily get estimated delivery date when you place the order. We will never stop to pursuit your perfection. If you happen to have any other questions or concerns, please do not hesitate to contact us via e-mail. 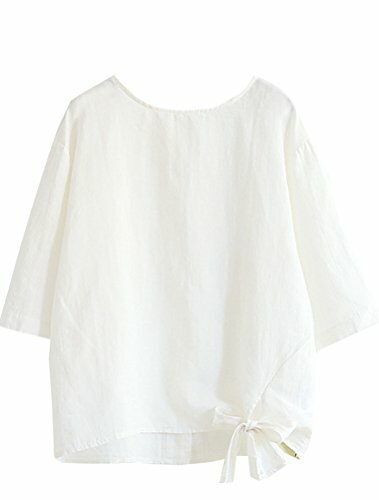 This casual blouse is made of lightweight breathable cotton linen material, designed with round neck, drop sleeves, back buttons closure, lovely bow knotted hem. 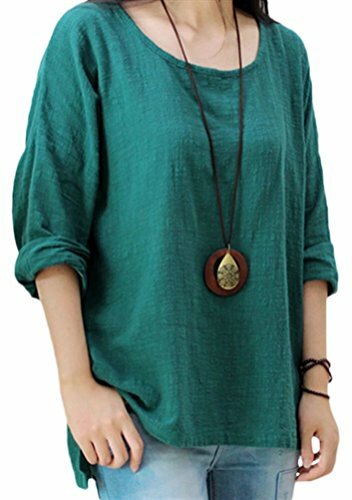 Loose fit tunics blouse can wear in spring, summer, autumn for any occasion:travel, holiday, trip, work, streetwear, party, home... Size Information Size M: Length:25.6", Bust:41.7", Shoulder w/ Sleeve:17.3", Sleeve cir:15.4", Cuff:15.4" Size L: Length:26.0", Bust:44.9", Shoulder w/ Sleeve:17.7", Sleeve cir:15.7", Cuff:15.7" Size XL: Length:26.4", Bust:48.0", Shoulder w/ Sleeve:18.1", Sleeve cir:16.5", Cuff:16.5" Size 2XL: Length:26.8", Bust:52.0", Shoulder w/ Sleeve:18.5", Sleeve cir:18.1", Cuff:18.1" Warmly Note: Color difference: We strive to make our colors as accurate as possible; however, due to individual monitor settings, we cannot guarantee that the color you see on your screen is the exact color of the product. Size difference: This size information is just for reference only,and allow 1-2cm (0.4-0.8") differences due to manual measurement. 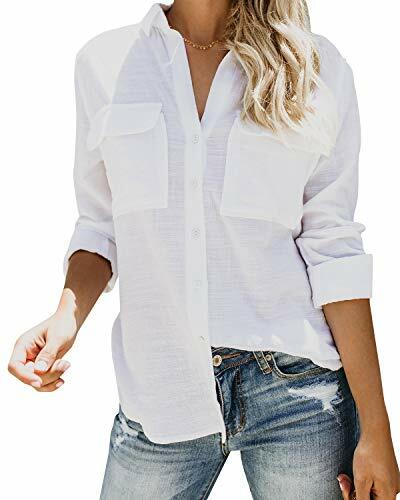 This cloth is women's 2019 new pretty spring summer fall blouse, solid color cotton linen clothing is designed with stand collar, hi-low hem, back three button design, roll-up sleeve shirt blouse. 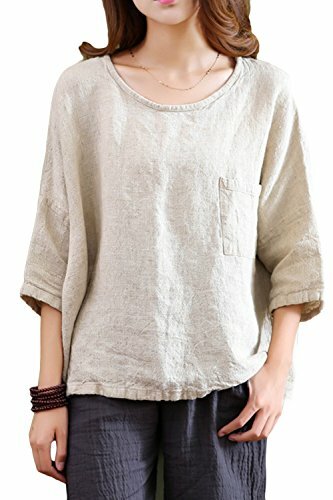 Loose and simple style Super soft cotton linen material, this linen top/blouse/shirt/tunic makes you more attractive, charming, fashion and elegant. 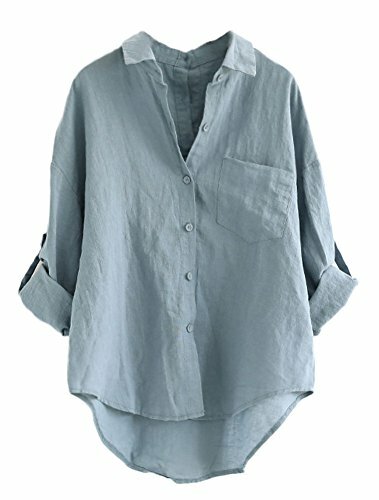 Features: Material: 45% Linen, 55% Cotton Sleeve: 3/4 Roll-Up Sleeves 4 Colors: Blue, Red, White, Black Season: Spring, Summer, Autumn Garment Care: Suggest to wash by hand or machine wash softly Size Chart: Size L:Length:75cm//29.5", Bust:112cm//44", Sleeve:47cm//18.5", Shoulder:56cm//22", Sleeve Cir:42cm//16.5", Cuff:25cm//9.8" Size XL:Length:76cm//29.9", Bust:122cm//48", Sleeve:47cm//18.5", Shoulder:58cm//22.8", Sleeve Cir:44cm//17.3", Cuff:26cm//10.2" Size 2XL:Length:76cm//29.9", Bust:132cm//51.9", Sleeve:47cm//18.5", Shoulder:61cm//24", Sleeve Cir:46cm//18.1", Cuff:26cm//10.2" Great Collocation: Jeans, Leggings, Shorts and so on. Good Gift for wife, Girlfriend or Daughter Occasion: Casual, Holiday, Weekends, Leisure, Vocation, Evening, Party, School, Homing. Free style suit for any occasions. Search Minibee for more products. Welcome to the order. Thank you. 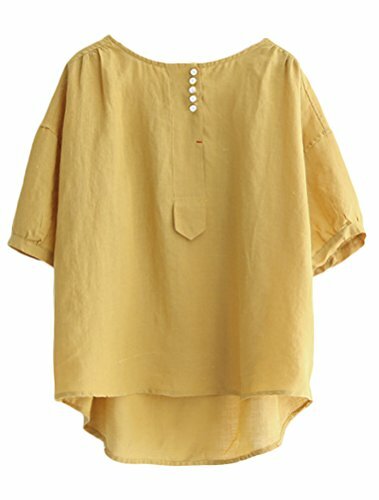 Minibee 2019 new spring lovely simple solid cotton linen top tees is designed with round neck, three buttons, hi-low hemline, and slit side, stylish and comfortable. Short sleeve ans long sleeve style. 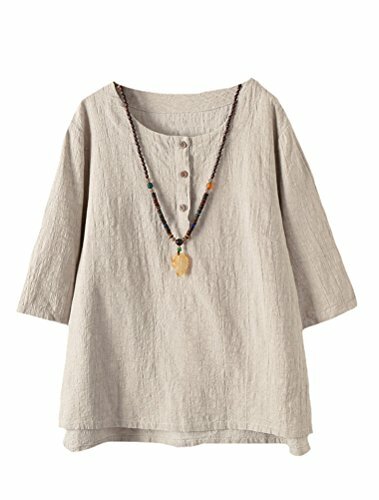 The fabric for this elegant tops tunic Tshirt is jacquard, simple tops, but elegant texture pattern,also very good price. 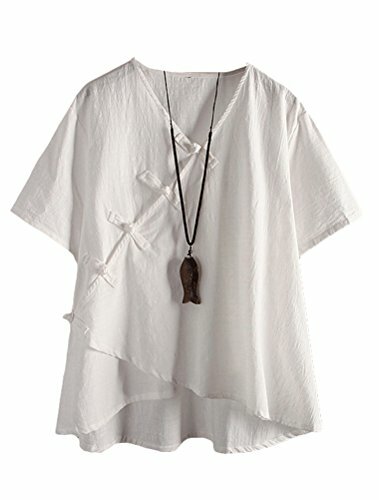 You can wear it as a summer Tshirt or layer with others inside during the cool day. 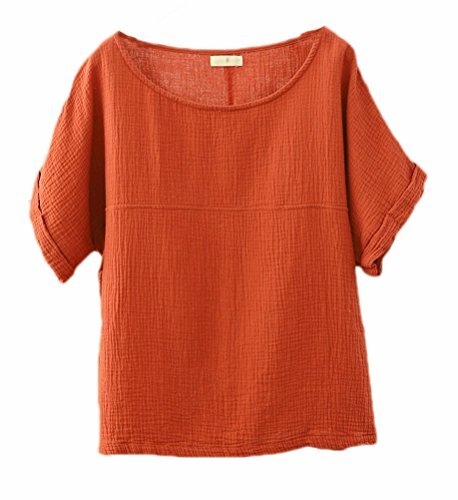 This jacquard tops tshirt clothing has 10 colors, size M-2XL for your option. 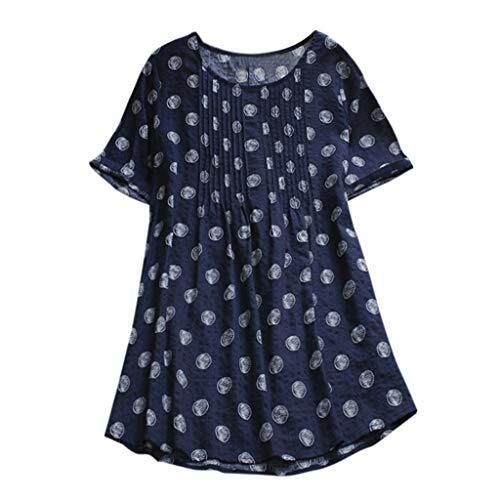 Wear this lovely tops tunic clothes to work, stay at home, any party occassion, you will get a lot of complement. 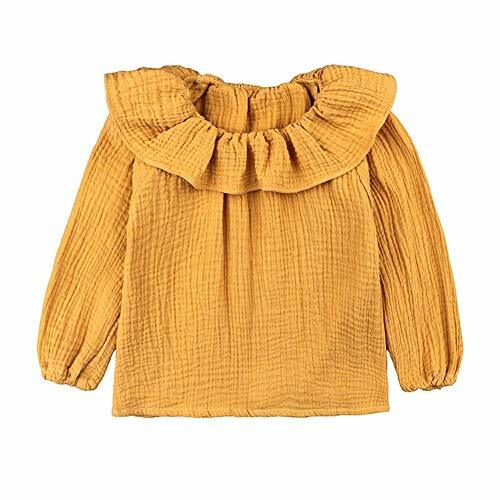 Size Information: Size M: Bust:104cm//40.9", Shoulder:43cm//16.9", Length(Back):71cm//27.9", Sleeve Length:35.5cm//13.9", Sleeve Cir:38cm//14.9", Cuff:32cm//12.5" Size L: Bust:112cm//44", Shoulder:44cm//17.3", Length(Back):72cm//28.3", Sleeve Length:36cm//14.1", Sleeve Cir:40cm//15.7", Cuff:35cm//13.7" Size XL: Bust:120cm//47.2", Shoulder:45cm//17.7", Length(Back):73cm//28.7", Sleeve Length:36.5cm//14.3", Sleeve Cir:44cm//17.3", Cuff:37cm//14.5" Size 2XL: Bust:132cm//51.9", Shoulder:46cm//18.1", Length(Back):74cm//29.1", Sleeve Length:37cm//14.5", Sleeve Cir:48cm//18.8", Cuff:40cm//15.7"
Mordenmiss has registered US Trademark "Mordenmiss". This item is only provided by Mordenmiss, and did not authorize any second stores to sell our items, if other seller follow selling our items, please kindly notice us or report to Amazon directly. Mordenmiss only gurantee our quality, we do not guarantee the quality of other sellers. 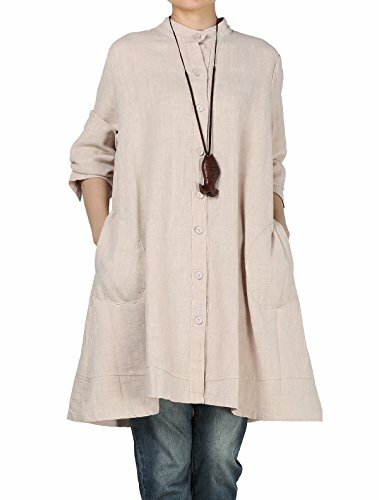 This coat is made of soft cotton linen,full front buttons,long sleeve,two side pockets,large hemline design, you can wear it in fall and early winter when you travelling. Detailed Size As Below: Style 1: Size M:Length:36.2",Bust:42.5",Shoulder:16.1",Sleeve:22",Sleeve Cir:17.3" Size L:Length:37.0",Bust:45.7",Shoulder:16.9",Sleeve:22.8",Sleeve Cir:18.5" Size XL:Length:37.4",Bust:48.8",Shoulder:17.2",Sleeve:23.6",Sleeve Cir:16.5" Size XXL:Length:37.8",Bust:51.9",Shoulder:17.7",Sleeve:23.6",Sleeve Cir:18.1" Warmly Note: Model size:Height: 5'3", Weight: 99lb Color difference: We strive to make our colors as accurate as possible; however, due to individual monitor settings, we cannot guarantee that the color you see on your screen is the exact color of the product. Size difference: This size information is just for reference only,and allow 1-2cm (0.4-0.8") differences due to manual measurement. 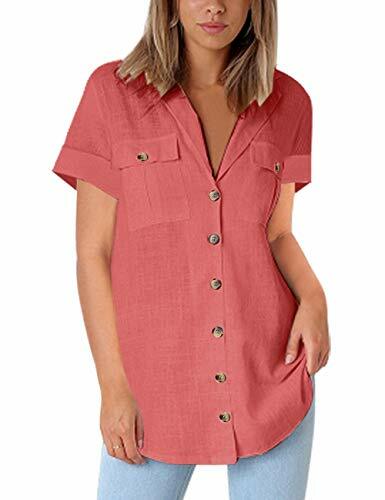 GRAPENT Womens Casual Loose Roll-up Sleeve Blouse Pocket Button Down Shirts Tops S-XXL Available in white, black, coral, navy blue, ultra pink and khaki. 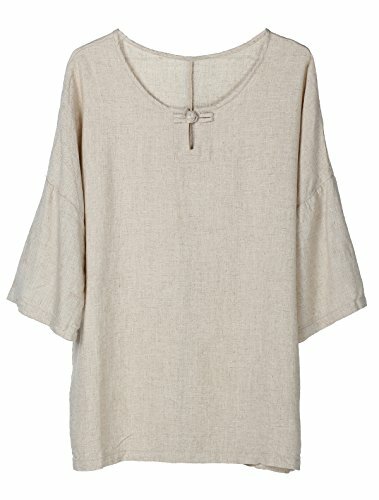 Featured with V-neck and cuffed sleeve. Loose fitted and button down design. 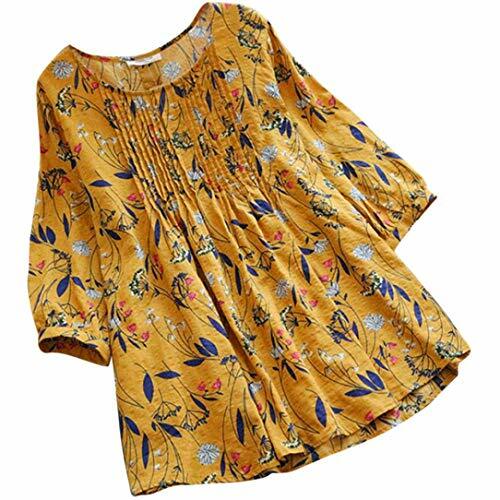 Roll-up sleeve blouse, you can make it a 3/4 sleeve or a long sleeve shirt. Two front pockets at chest with button closures. Fashion and classical style. Lightweight, comfortable and breathable to wear with cooling feeling, soft touching. Suitable for casual, daily work and vacation in summer, fall, or spring.